The Renault-Nissan Alliance has created a new 300-person division for the purpose of releasing at least 10 vehicles with "significant" autonomous driving capabilities by 2020. Nissan and Renault's new Mobility Division will focus on the development of software, cloud engineering and big data analytics for connected-car technologies. In 2018, Nissan said it expects to unveil a "multiple-lane control" application that can autonomously negotiate hazards and change lanes during highway driving. Two years later, it plans to add the capability for a vehicle to navigate city driving and intersections without driver intervention. Nissan Motor Co. General Manager Tetsuya Iijima removes his hands from the steering wheel of an autonomous drive Nissan Leaf as it pilots itself through Sunnyvale, Calif. on Jan. 7, 2016. The new autonomous models will be released in the U.S., Japan, Europe and China. In September, the Renault-Nissan Alliance acquired French software company Sylph to accelerate the expansion of its connected vehicle and mobility services programs. 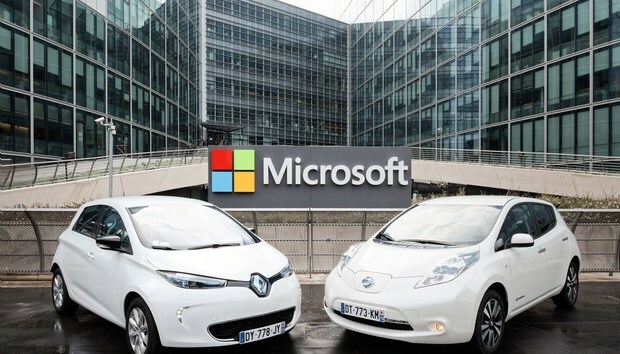 Also in September, the carmakers penned a multiyear agreement with Microsoft to develop next-generation connected services for self-driving cars that will be enabled through Microsoft's Azure cloud service. The carmakers said they will also focus on promoting "social acceptance" of autonomous vehicles between now and when they begin to launch them in 2018. Educating the public will "allow consumers as well as involved governments, groups and other agencies, the time to consider the benefits of the new technologies. "There must be a huge change in government and society," Nissan stated in a blog. "Once autonomous drive technology reaches a certain level of technological advance, decisions must be made on driving infrastructure and laws to ultimately change society's mindset." While autonomous development announcements are far from new, the Renault-Nissan Alliance is unusual in that past autonomous vehicle efforts have not been taken on solely by automakers, according to research firm IDC. "In many cases outside of Tesla, it has been platform players such as Google and Uber who have been making the most noise in the autonomous driving space, while the auto manufacturers continue to promote their user interfaces and safety features, such as spatial awareness technology and infotainment capabilities," IDC said in a research note. There are, however, "concerns" about the carmakers' ability to compete with Silicon Valley platform players, IDC said, on issues such as safety and security, wireless network development and regulatory compliance. "One concern for Nissan has to be its ability to successfully develop a sufficient connected vehicle solution," IDC said. "While automakers are accustom[ed] to building solutions internally, it is unlikely that they have the potential to develop at the same rate and quality as some of the technology platform players (i.e. Google, Uber)." Nissan and Renault's inability to scale could affect their return on investment -- exponentially so, if the quality of the product is not comparable, IDC said. Even if the carmakers aren't as successful as rivals in developing self-driving technology, their efforts are expected to boost connected vehicle development in the auto industry, IDC said. Artificial intelligence and connected technology are a major focus among some carmakers, who see it as the basis for future human-machine interface development in autonomous vehicles. Last year, Toyota Motor Corp. spent $1 billion to create an artificial intelligence division. Toyota's Research Institute is being led by Gill Pratt, who joined Toyota from DARPA, where he ran the Robotics Challenge, an event that promoted work on robots that can work with humans.